2 plants of each cut & come again salad variety (6 x 2). Tasty 'finger' cucumber approx. (4") long; great for packed lunches and picnics; good for container growing; high yielding - up to 5 fruits per leaf axil. 3 organic plants per pack. Early variety with long stems and upright leaves; vigorous growth and highly productive. 10 organic plants per pack. Short, attractive, dark green fruit; can be grown outdoors in most areas. A lovely mixture of various coloured stems and leaves, use as baby leaf or allow to grow on. 5 organic plants per pack. Early long-cropping variety; start to harvest in September from a June planting. Very good resistance to white blister; suitable for harvest from early November through December. Autumn red with a very long field standing ability. Cabbice Cabbage is a super sweet variety with an intense sweet flavour. This variety has crisp, thick leaves, giving you a deliciously crunchy texture that is perfect when used raw in salads. Cabbage when cooked properly or used raw is one of the most versatile vegetables available as it can be used in a variety of dishes and recipes. With planning it is possible to grow different varieties to produce them all year around. A hybrid variety of this traditional type of cabbage with dark-green outer leaves. Deadon produces solid heads with a red tinge. Maturity approximately 110 days after transplanting. A cross between Danish and Savoy cabbage, Stanton produces compact, dark green round heads. A vigorous variety with excellent standing ability and cold tolerance. Maturity approximately 130 days after transplanting. Deepest purple curds; perfect for adding colour to any summer or autumn dish; delicious and highly nutritious; good heat tolerance. Romanesco type with lime-green 'pinnacles'. Vigorous variety with round smooth bulbs. Kalettes® originally known as 'Flower Sprout®', the new vegetable, as cross between a Brussels sprout and kale. The inspiration behind Kalettes® came from a desire to create a kale type vegetable which was versatile, easy to prepare and looked great. The result is a truly new vegetable with fantastic flavor which combines the best flavors from brussels sprouts and kale, resulting in a fresh fusion of sweet and nutty. They crop from November until March. 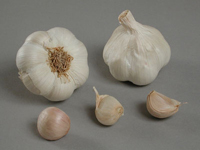 Resistant to club root and powdery mildew making it ideal for growing organically; winter hardy and can be harvested from October to February; purple skin with fine yellow flesh. Sweetbell F1 is a small turnip [6-8cm diameter]. The flavour is exceptionally sweet with firm crisp texture and unlike most turnips, ideal for raw use in salads and stir-fry etc. as well as for cooking. Fine mesh netting which protects against carrot fly, cabbage root fly, caterpillars, birds, rabbits, wind & hail. Very strong, lasts for years. Maincrop - Scapa is a cross between Mayan Twilight and Mayan Gold. 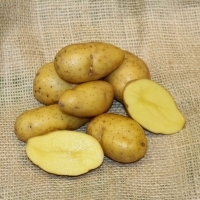 It produces long oval tubers with yellow skin and deep yellow flesh; perfect for boiling and mashing. A well-known and reliable very early variety. It comes from French production but is well suited to UK growing conditions. 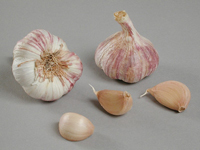 This softneck* garlic has a Royal Horticultural Society Award of Garden Merit and produces purple bulbs with a mild yet rich flavour. French white-skinned softneck* variety with beige cloves for autumn planting.